Slumdog Millionaire (2008) | Tales From The Ipe! My wife and I both had the day off today, so we celebrated by having a date. 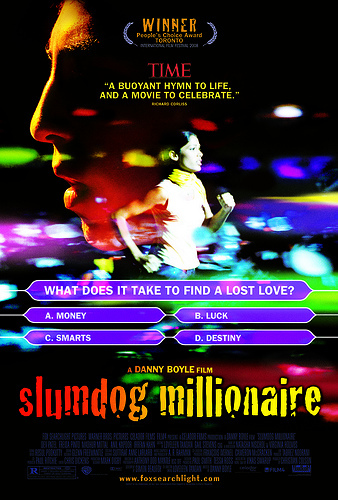 With no kids in tow today, we went to see the critically acclaimed Slumdog Millionaire, a movie by Danny Boyle. Frankly, an excellent movie all around. This is a movie that I can appreciate and adore. You have great character development so the audience can understand and empathize with the characters, you have a moving drama to keep you interested, eye-catching cinematography, and a toe-tapping soundtrack. I also appreciated that the movie didn’t pull any punches — when bad stuff could happen, it did. I hate that fake Pollyanna stuff. I recommend this movie. The movie trailer is here. This entry was posted in Personal and tagged movies. Bookmark the permalink.